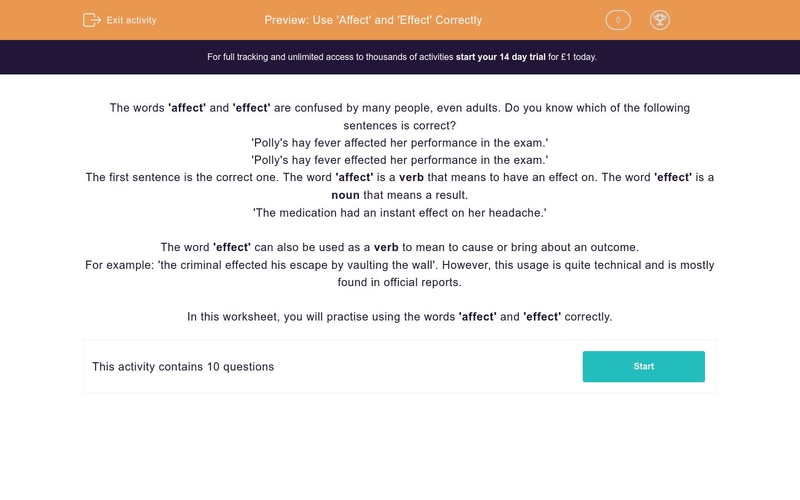 In this worksheet, students practise using the words 'affect' and 'effect' in the correct contexts in their writing. The words affect and effect are confused by many people, even adults. Do you know which of the following sentences is correct? Polly's hay fever affected her performance in the exam. Polly's hay fever effected her performance in the exam. The first sentence is the correct one. The word affect is a verb meaning 'to produce a change in something'. The word effect is a noun and means 'a result'. The medication had an instant effect on her headache. In this worksheet you can practise using the words affect and effect correctly. Decide whether the following sentence uses the word affect correctly or not. Bobby's friendship with Jake has had a bad affect on his behaviour. Decide whether the following sentence uses the word affected correctly or not. Will our holiday be affected by the air traffic controllers' strike? Decide whether the following sentence uses the word effect correctly or not. Mina's new teacher had an immediate effect on her work. The pollution incident had a terrible effect on the wildlife near the river. Decide whether the following sentence uses the word effected correctly or not. I can't see why we should be effected by the new rules. This time, choose the correct word to complete the sentence. Write it in the answer box. Jaden was greatly __________ by the death of his grandmother. Choose the correct word to complete the sentence. Write it in the answer box. The earthquake __________ thousands of people. I tried to persuade her not to go, but I had no __________ on her. Cigarette smoke always __________ my asthma. The high price of oil has had a big __________ on petrol prices. The correct choice is 'effect' is because we are talking about the result of Bobby's friendship with Jake. The verb &apos;affect&apos; is the correct choice here. This is correct because we are talking about the result that the new teacher brought about. Again, we are talking about the result of the pollution so &apos;effect&apos; is correct. A verb is needed here, so &apos;affected&apos; is the correct choice. A verb is needed in this context. A verb is needed here, too. We are talking about a result here, so the noun 'effect' is needed. A verb is needed here. A noun is needed here because we are talking about the result of the high oil price.